Okay, so I actually used summer squash. I pretty much interchange them, although they are not the same. These were good but I have a feeling they needed just a little something else. A drizzle of chili sauce, maybe. Or some other form of condiment. Or maybe a little kick in the batter. The problem must be that I didn’t totally follow the recipe, which called for a chili in it, because I didn’t have a chili. Oh well. I’ll give you a few recipe ideas, since I have not yet perfected it: the ones I made were from Rancho Gordo, and I imagine they will be better later in the season when I get some peppers. However, I also (the next day, of course) came across this recipe from Saveur, which also looks excellent. Let me know what you come up with in the comments! The basic of vegetable fritters/pancakes/whatever is grated vegetable that is strained, mixed with a few things, and fried/griddled. 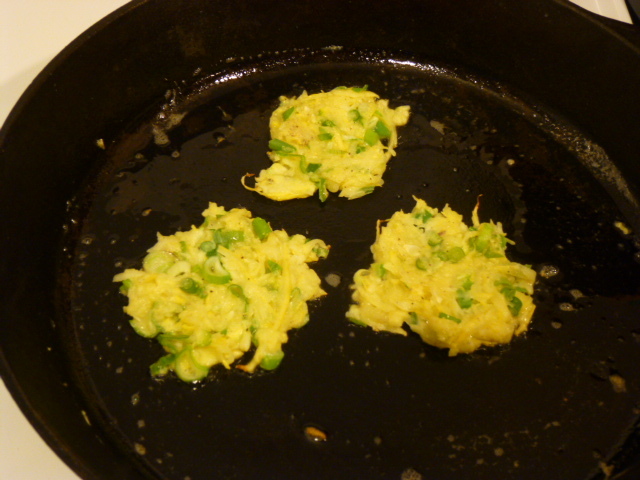 Same basic idea for latkes. Fresh corn cakes you don’t have to strain. Once fried, I topped them with local Jacob’s Cattle beans I had made the night before and some veggies. I love beans. I probably have told you that already. They are delicious and earthy. And Jacob’s Cattle beans are so pretty (granted, they are less so when cooked. But more delicious). Dried beans are much tastier than canned beans, and feel more like a dish in themselves than an ingredient. Dry beans are also very cheap, so make for good budget food. If you like, you can make a big batch and them freeze them so you have them on hand for quick meals. I like soaking my beans, although I’ve cooked them successfully unsoaked before, so if you are unprepared, you can still enjoy them. Keep in mind that they do take a while to cook though, and cooking time can be a little unpredictable (depends on elevation, the season, the weather, your mood…). Put the beans in a large-ish pot (at least twice the size of the amount of beans you are cooking) and cover with at least an inch of water. Let soak for 12 hours or overnight. Keep the soaking water! It will make them juicier and more delicious. Add a little extra water if they have soaked everything up, and spices if you like (these can also be added partway through the cooking process). Bring to a boil, then turn down and simmer (you should have a nice burbly sound happening) for about an hour. When they are getting tender, THEN you can add the salt (otherwise they won’t cook. I’ve never actually done that, but everyone says). Cook a little more until nice and soft (there still should be some thick juices in the bottom, don’t let it go dry. If you have to add water I like adding boiling water. You can also add stock if you like, or even cook them with some bones or bits of meat to make them a little richer). Top with whatever you like, and enjoy! I had the fritters, beans, tomato, parsley, tomatoes, and some slivered cheese. I look forward to doing them again with a little corn on top, or maybe a cilantro sauce. Look at that gorgeous color! Beets are so cool. This even has golden beets in it as well as the classic purple ones, but the pink colors kind of takes over. Yum. This is about the only way that I do tofu. When I get tired of it, I’ll probably branch out (in fact, I’m thinking I will probably run out of all my basics to tell you about here so I’ll need to really try some new things. I’ve been wanting to get some new cookbooks too which will hopefully help). 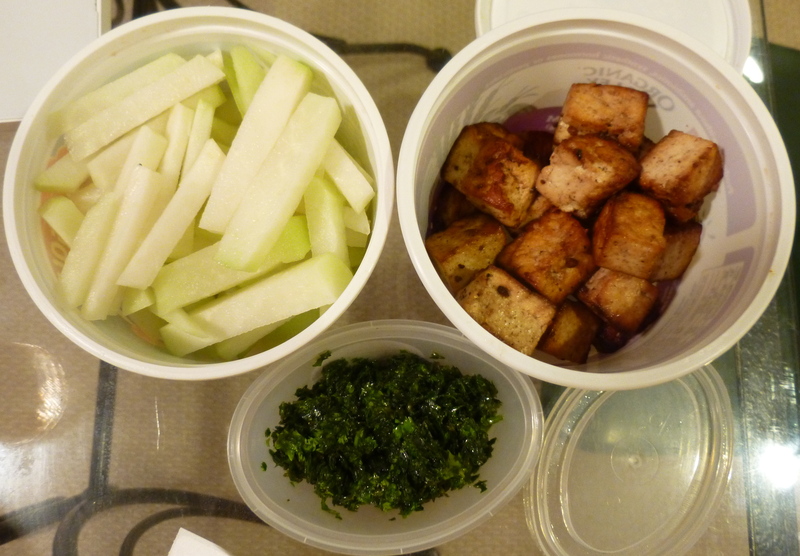 But tofu soaked in soy sauce and fried is just so good, why do it any other way? Also, you can get Maine-made tofu! 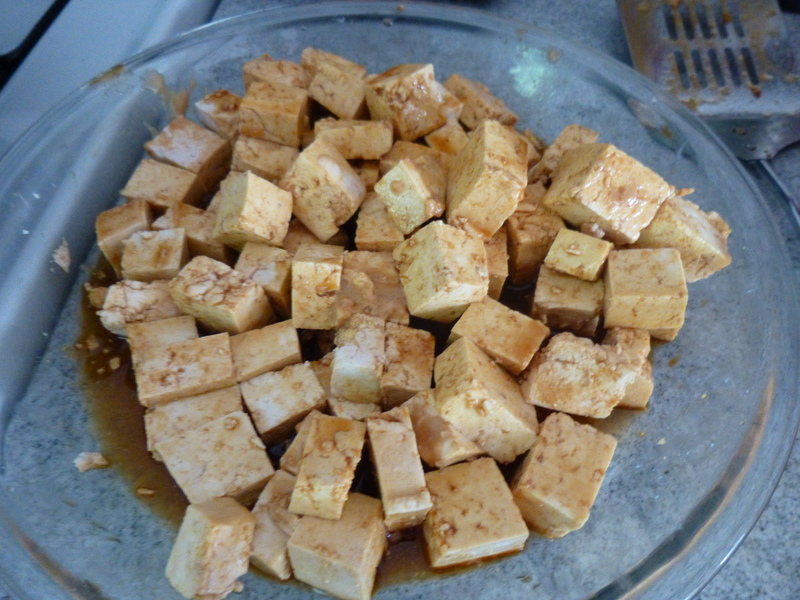 It is called Heiwa tofu. I honestly don’t know much about different varieties of tofu and what makes one better than another, but it tastes pretty good to me and I like supporting a local. 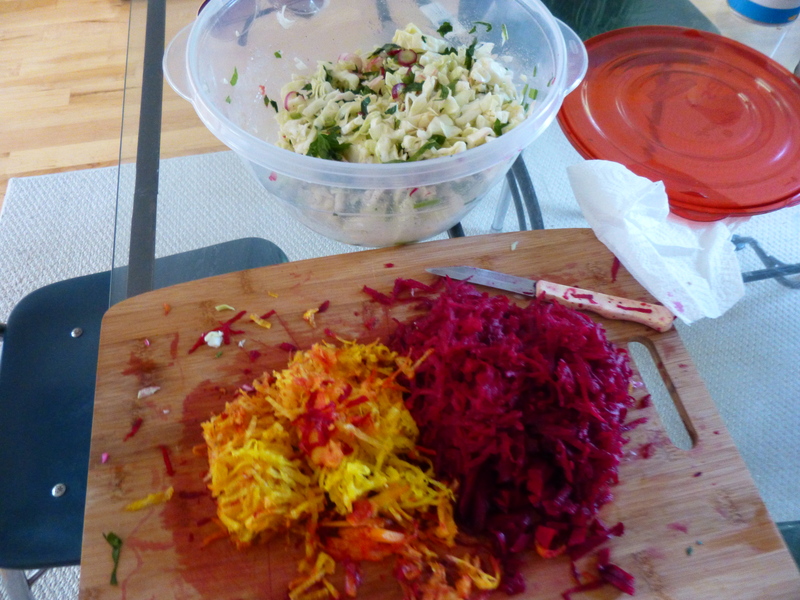 The slaw recipe came from my farmers, who publish a few recipe suggestions with each CSA. It is a very fresh slaw, letting the vegetables feature rather than the dressing. Have I told you about my farm yet? It is called New Beat Farm and is horse-powered (as in, only uses horses, no fossil fuel) and certified organic and generally just awesome. It’s a beautiful spot near Knox, Maine. I get eggs from them as well as vegetables and they are delicious. 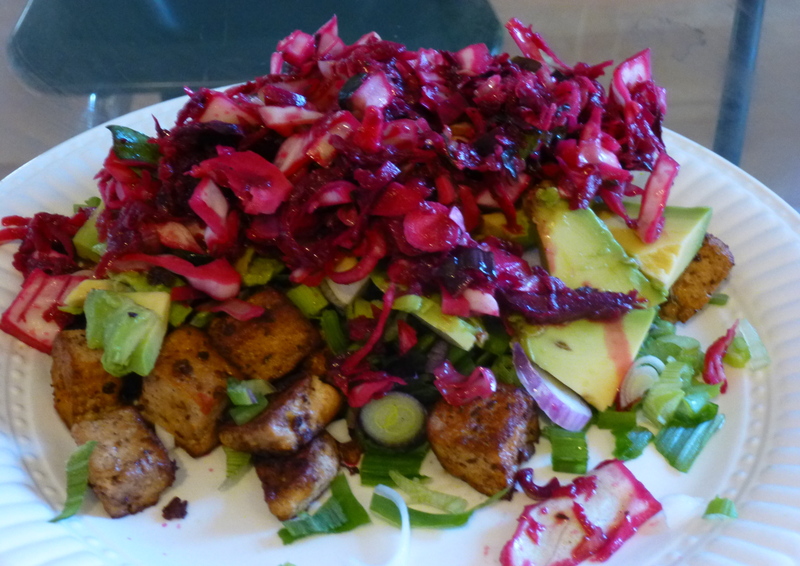 I also added an avocado to this salad-thing. Not totally necessary, and a little extravagant since avocados do not, in fact, grow in Maine, but very delicious. There is unfortunately just no local substitute for the texture and light flavor of avocados. 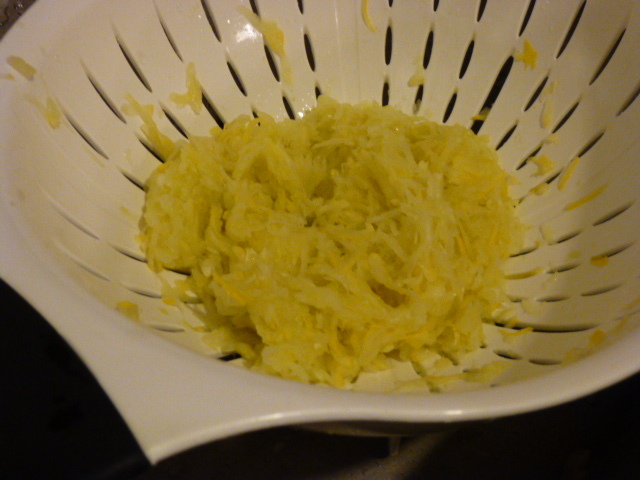 For the slaw (you can make this ahead of time if you want): Cut up the cabbage in thin strips. My mini food processor is not small enough to do this, but if yours is, go for it. Grate the beets (same deal with the food processor). Slice up the scallions thinly. Mix together the oil vinegar, salt and pepper. Put everything together in a bowl and mix. Let it sit, mixing every few minutes for about 20 minutes. 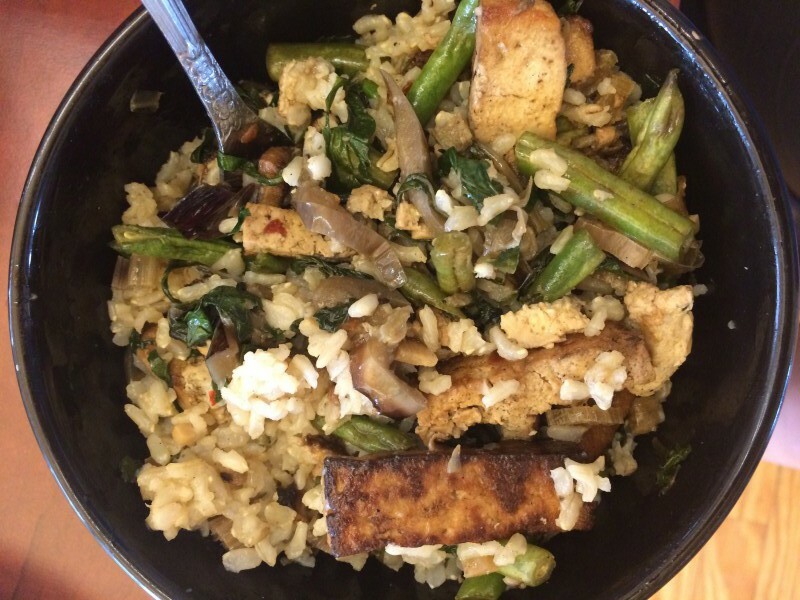 For the tofu: Cut it up in small chunks. I like doing this because it is so easy to cut in straight lines and make them all the same size. Not that it really matters (although you always want ingredients to be around the same size so they cook evenly), it’s just pleasing. Put them in in a flat-ish dish (I like to use a pie pan, because it is flat but wide and has some sides, unlike a plate) and sprinkle with soy sauce until there is a thin layer of soy sauce at the bottom of the pan. Let it sit for a few minutes, turning them over every now and then with a spatula, until they are all brown. Heat up the oil – there should be a shallow layer in the pan (I use cast iron, but then again it’s my only pan so I don’t have much choice) – over medium-high heat until quite hot. Make sure you are wearing an apron. Carefully put the tofu into the pan. It will spit! (This might be a good place for one of those spit-guards if you have one.) You can add the leftover soy sauce if there isn’t much, but don’t add a lot of it – you want them fried, not steamed, and they can get too salty if you use too much. Let them fry for a few minutes, them turn them over with a spatula, again being watchful of spitting oil. Turn every few minutes until they are nicely golden brown on all (or at least most) sides and, most importantly, crispy. Now you are ready! Put some tofu on the plate (leftovers keep in the fridge and are also good cold), top with extra scallions if you like, then avocado and the slaw. I ate this kind of as a salad, I guess, but I think it would also be excellent on a sub. 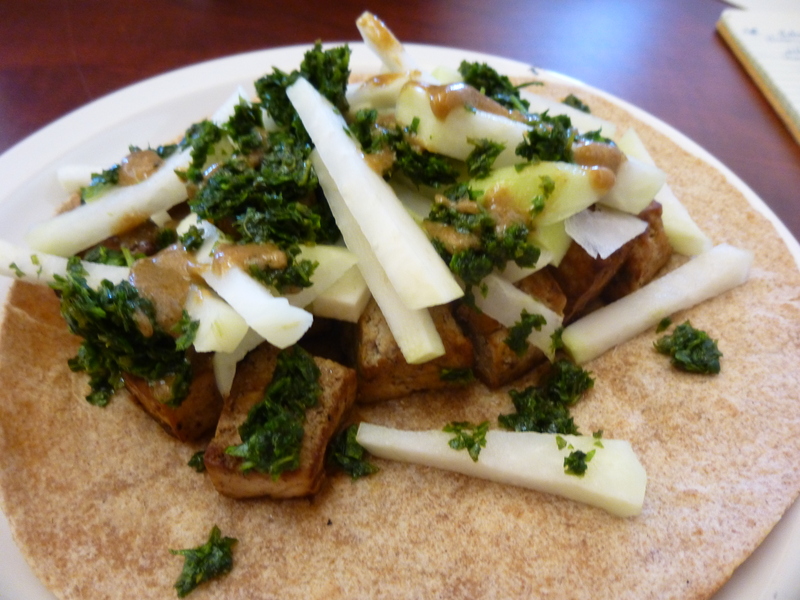 Fried tofu is also good with sliced kohlrabi and parsley (and some scallions), drizzled with a little lemon or a vinaigrette. Which is what I packed for lunch at the office the other day. And then I had to take a picture at work when I assembled it. Don’t worry, no one was around.